Sometimes taking care of the little things can be such a drag. They’re just so, well, little. I tend to put tasks like this off indefinitely—that tiny nail hole in the wall that needs to be spackled, the chipped paint on the windowsill that could use a touch-up. They seem so inconsequential and undeserving of effort, so naturally they’re the most irritating. These tiny repairs aren’t just annoyances, they’re like living with a bunch of little demons. “Seriously dude, just spend the five minutes fixing me already and move on with your life,” they sneer as you walk by. They push and push until all of those little moments you’ve spent thinking “hm, I should really fix that already and move on with my life” compound into something quite wearing, which makes you question your very right to consider yourself a competent, able-bodied person who cares about their house. At least that’s how it goes for me, I don’t know what your deal is. 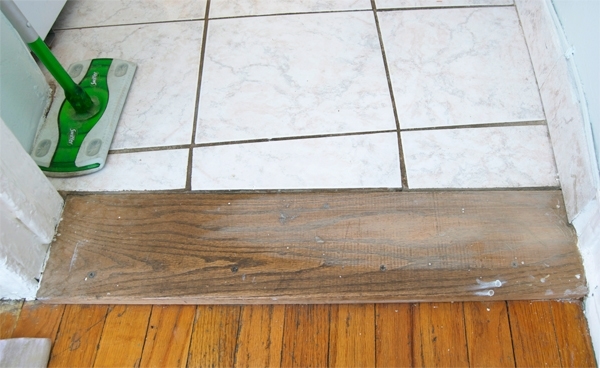 One little thing that had been bugging me for months was the big threshold between the kitchen tiles and the living room hardwood. It’s big and wide and ugly and spattered with paint. It wasn’t actually this bad since I had already started sanding when I thought to take a picture (see top right corner, obvs). But still. Next to that tile, it’s like a big shitstorm of ugly. It took about 5 minutes to sand the thing down and another 5 to apply some leftover stain, the Minwax Jacobean 2750 that I used on my desk. The next day, it took another 5 minutes to put on a coat of tung oil. That’s 15 minutes, for those who can’t add. And guess what? This little crap makes me stupidly happy. Is it perfect? Far from it. Is it as good as it’s likely to get? Probably. And while I wouldn’t consider any room (particularly the living room) in this apartment “done,” it’s nice to consider that little tasks like this are worthy of attention now that I’m more in the “pimp it out” phase than the “paint the walls” phase. Now those tiny nail holes… I will destroy you. Someday. When I get around to it. santa claus is in the details. Countless time has been wasted in this house thinking about that fingerprint on the wall in the stairway, the smudge of wall paint that got on the ceiling or the hook that needs to be installed in the hall closet. Maybe it is the joy of completing these small things that lets me repeat history over and over again? I have been reading your blog and it has given me a different outlook on how to view apartments. Keep up the updates, it’s cool when people blog about their lives, you can see how they transition as people and how their homes are transformed over time. You are def a clean person, check out those Shoes on the blue mat, CLEAN! Well thank you! While I do spend a fair amount of time cleaning, it’s only because I’m naturally a pretty sloppy person, actually. But I’ll spare you the pictures of my laundry on the floor and dishes piled up in the sink :-). 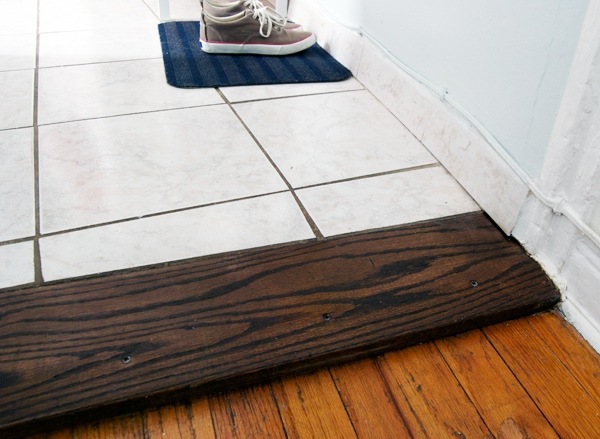 I have had two different thresholds in my home that were both bothering me for months and months. Eventually I just had to pay someone else to deal with it. It was worth every dime. It took us about three YEARS to get around to putting a threshold between the kitchen and the dining room in our house, but once I finally did, it made SUCH a big difference. You know that black mega-threshold in my vestibule? I still haven’t glued the thing to the floor. It would take me all of 5 minutes (3 to locate the construction adhesive, 1 to apply it, and 1 to find something heavy to hold it in place), but it seems like such a monumental hassle. I had a couple of picture hooks in my master bedroom (leftover from previous owners) for years. It took a whole house renovation to finally give me the impetus to get the pliers, pull the nail out, patch it, and paint the patch. Of course I also had to change the entire room’s wall color at the same time. It’s amazing how these tiny things can snowball into much bigger things. If you let them. If I let them, that is. Can we be roommates? Please? the big things in life are great, but often its about the little things. i’m repeating that to myself daily, so hopefully one day i’ll learn it! your 15 mintues really paid off. So true! I’ve been trying to keep in mind this quote from Charles Eames that goes “The details aren’t the details. The details make the design.” It’s a little thing, but it makes a big difference in how I feel about the whole space and things starting to feel more polished as opposed to “it’ll clean up well,” ya know? Eva commented that the newly refurbed threshold says “hey, take my kitchen seriously.” I agree! Eva’s one smart woman! Now if only I could take my own advice and start painting my trimming I’d be a smart woman too! Ugh, so know what you mean. Our cottage is, really, just a long list of tiny tasks that will likely never get done. ah minutia. it haunts me. your first paragraph pretty much describes me to a T. I’m about to lose my sh*t over a spiderweb of chords sitting behind our record player/entertainment situation. it’s always a pleasure to visit your blog. word. Number 2. You just described my life. Gah I forgot to come back and respond but that link (actually, all that guy’s work!) is incredible! I smiled all the way through. Thanks! I have a few questions for you and wondering if you can help me..
1. You’ve mentioned in past that you buy your wood pieces cut to size at a home depot- which HD is this?? 2. Do you know if you can mix 2 minwax stains. I want a dark brown stain in between Ebony and Jacobean. have you ever tried mixing 2 stains before? or do you think I can acheive it by reapplying a few coats of jacobean?? 1. Ugh, stupid Home Depots in Manhattan won’t cut wood to size, only in the outer boroughs or Jersey! I’d recommend Prince Lumber in Meatpacking (which actually has a huge hardware store as well)! 2. You can absolutely mix two stains! Just as long as they’re both oil-based or both water-based, that should be fine. If you want something between ebony and jacobean, I’d add tiny amounts of ebony to the jacobean until you get what you want… an even ratio will probably be much darker than you’re looking for. yes stupid HD’s won’t cut to size.. I’ve played the “i’m a woman card” + “I’m a mom and look at my baby card and they still don’t have the heart to cut to size! I just stumbled on Prince Lumber the other weekend but it was shut so thanks for the tip! !